We are in the thick of summer! And with at least one BBQ every weekend we thought we could showcase a few BBQ or potluck items, perfect for summer and for those who just can’t wait for Halloween. If someone says BBQ to you, it is usually burgers and dogs are we right? Now, please know, that here at Halloween Alley – we are not food bloggers. But, with that being said, we want you to Celebrate Life. Halloween Style! So we whipped you up 4 quick and easy BBQ dishes perfect for at home, or a potluck. 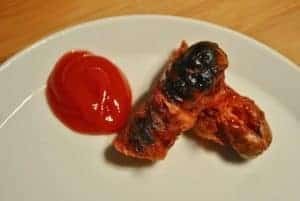 If you missed our last blog, we did a take on a bloody finger hot dog, you can find that, and more ideas on an summer party for those who love halloween here. 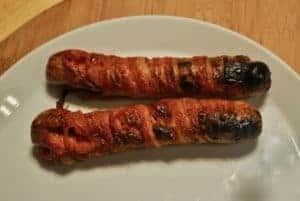 Or if you’re hosting this weekend, why not serve some Charred Zombie Finger Dogs? 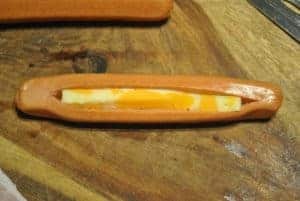 Super simple, make a cut lengthwise through the dog, but not all the way through. 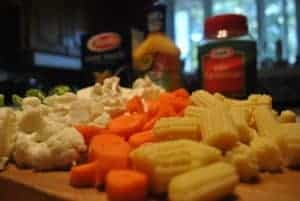 Insert a small slice of cheese, or some grated cheese of your choice. 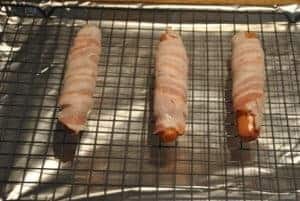 Wrap with bacon. 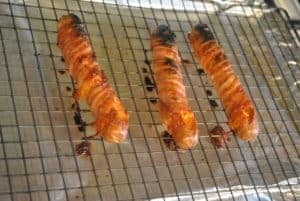 Place on a baking rack over a cookie sheet, and cook at 350 for 15 minutes, then finish on broil for 2-5 minutes. Or BBQ at your leisure. If zombies have you running for mum – then we think you will love this mummy wrapped baked brie! Buy the brie of your choice, a package of puff pastry from the frozen isle, let that thaw according to directions. 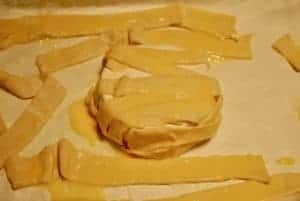 Lightly flour your work surface, and cut the puff pastry into strips. Wrap brie. 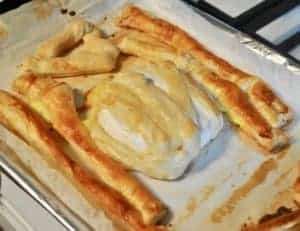 Brush pastry with an egg wash. Bake at 350 for 18-20 minutes or until pastry is golden and crispy. We cooked extra strips, and used them to decorate the plate. As well as for transporting that gooey brie to our mouths. 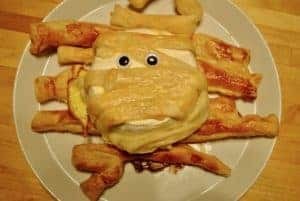 To make the eyes, we just used some googley eyes we had on hand…but you could also use a small piece of meat and the outer portion of an olive if you have them. 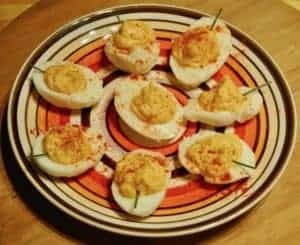 Now, again, we are not food bloggers, but considering the staple that devilled eggs have had on all of our granny’s tables, we tried to re-create that simple classic, with a pleasantly pumpkin devilled egg. Bring eggs, and water to a boil for 2 minutes. Let stand for 15 minutes. Remove from heat, and cool with ice and cool running water. Now the hardest part for us, was to peel them as gently as possible to give you that smooth, neat egg white. So good luck to you. 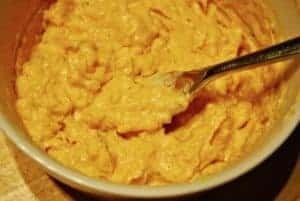 While your eggs are resting, whip together mayonnaise, dijon mustard, salt, pepper and a touch of paprika. Once your eggs are peeled, gently cut them length wise, and remove egg yolks. 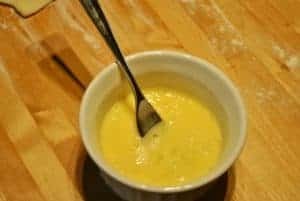 Mix the yolks together with your mayo mixture. And dollop back into your arranged egg whites. Top with a small sprig of chive or parsley for a stem, and finish with paprika. 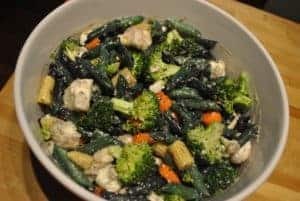 Lastly, take a summer staple of pasta salad, and kick it up a halloween notch, by dying your noodles black before mixing together. 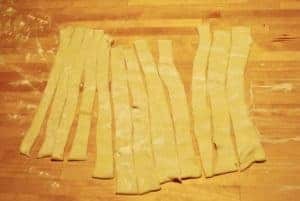 Start by preparing your pasta of your choice according to the box directions. Once cooked, drain and rinse under cold water to stop the noodles from continuing to cook. 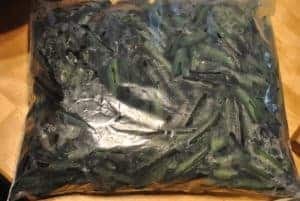 In a large ziploc bag, add food colouring (we used a black gel dye) add noodles, and mix. Let sit for 5 minutes. 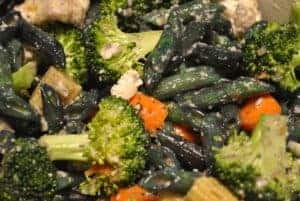 Add whatever veggies you have on hand (we used carrots, broccoli, cauliflower and baby corn) some italian dressing, and parmesan cheese. 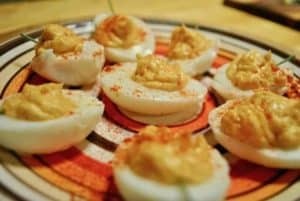 Perfect summer BBQ potluck dish and Halloween lover! Don’t forget to follow us on Instagram as we continue to countdown to Halloween!